Three words: your, air, conditioner. Ice is probably the last thing you would think to worry about in the middle of summer. 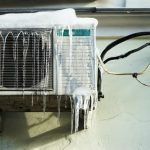 However, a frozen air conditioner remains one of the most common issues we face this time of year. This is one of those rare occasions when it’s just not cool to be too cool. 1. Check your outdoor unit for ice. You will be able to see a thick coating on the pipe. 2. Your indoor unit is wet. This is likely due to ice on the evaporator unit. 3. Remove the cover from your indoor unit. Without touching anything, visually inspect for ice. If you feel apprehensive about completing any of the following steps, we recommend calling a professional. A service call will cost you less than a repair bill if you accidentally cause more damage. 1. Turn your system off at the thermostat. 2. Let your system thaw by removing the indoor unit cover. 3. Help your air conditioner thaw more quickly by switching the fan to ‘on’. If you found the ice on your unit indoors- make sure to place towels underneath. This may take several hours. 4. Once the ice has melted, you can replace the cover and turn your system back on. Your home may take several hours to cool back down. If you still notice you home not cooling properly, it’s time to call in the professionals. We hope you will call us first.